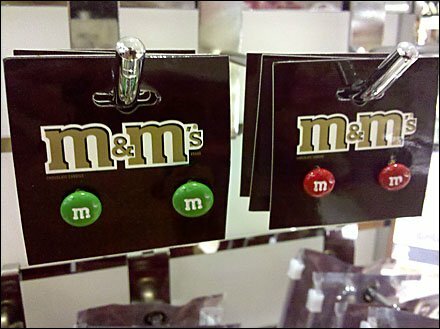 More interesting than the Chrome Single-Prong Hook fixtures is the concept of M&M’s as earrings and the Chocolate Brown branded look of the card backers. Nearby was Reeses jewelry but two of my favorite chocolate treats sent me scurrying for the sweet shop rather than a jewelry purchase. In that M&M’s is Mars and Reese’s is Hershey’s someone must be licensing the brands for bling. Interesting to find the jewelry at a major department store not a small trendy mall shop.